Chewy, salty, tangy, crunchy, greasy, and delicious. I give you one guess for what I’m talking about. Here’s a hint; it’s not Raw Kale salad with Goji Berries and Hemp Hearts (though actually, that sounds pretty good). Who invented pizza? Some Italian I suppose. But really, they couldn’t have done it without Columbus (for good or ill) and his ilk bringing tomatoes back from the “New World”. Think about that. What did the Italian’s eat before Marco Pollo brought pasta back from China and European imperialists brought back tomatoes from North America? My guess is nothing but lentils and olives, morning, noon, and night. What, you may ask, has any of this to do with my aforementioned topic of pizza, and more importantly, gluten-free pizza? This: pizza has been around a long time and we Americans* (and I would guess a lot of other folks) love it! 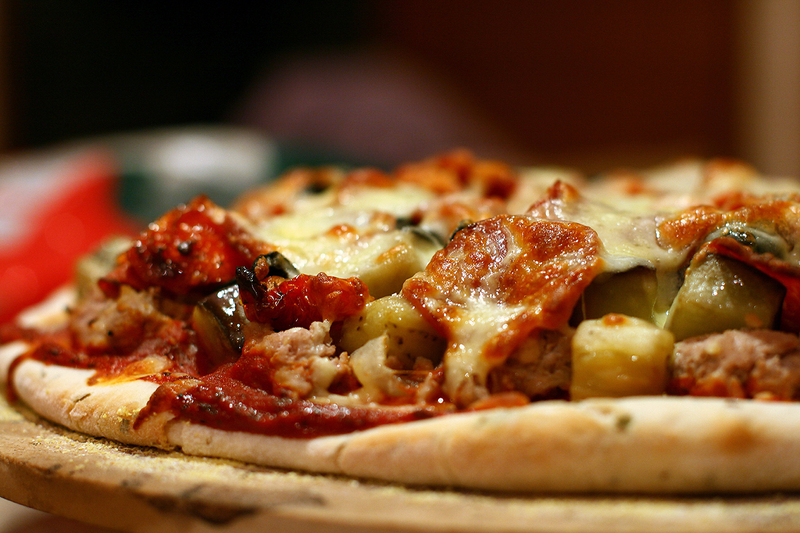 For people that are gluten intolerant or celiac, pizza has probably fallen off their menu. That’s not necessarily a bad thing if you were used to horfing down 5-6 slices at a go, and eating it three times a week, as it is, I should point out, a high calorie food. But for most of us, we didn’t eat it too often, but now MISS IT AS MUCH AS AN AMPUTATED LIMB! When my son and I had to go G.F., I tried a few frozen crust options even though it went against my nature to buy pre-packaged anything. But not only were they expensive, they were GROSS. So I tinkered, and took notes, and tinkered, and took notes, until I created a crust that at least passes the gauntlet of my son’s gourmet palate (this boy’s favorite food at age two was broccoli and sushi). The recipe creates a thin crust, rather than bready, which is actually more traditionally Italian (at least from my experience in Italy). I went for texture as well as taste, as the crunch and chew are equally as important as the flavor of a pizza crust. As I’m not really a food blogger, please forgive the rather lax measurements. Cooking, for me, is really all about feel and taste as you go along. If you don’t groove on that, probably there’s a much more compulsive chef out there with exact recipes (though I bet they don’t taste as good!). (Optional: 1/2 Sourdough starter if you have it ’cause it gives great flavor, and 1Tbsp chia seed just because). Directions: Mix water, yeast and sugar, rice flour (and gum if using) and let sit for a couple hours, stirring and adding a bit more flour occasionally. Or if you have sourdough, just put it in and forgo the stirring and waiting business. That just adds flavor. Dissolve the gelatin in hot water and add it with the rest of the dry ingredients and mix well. Should be about as soft as cake batter. Adjust as necessary with more water, or more oat flour. Let sit 40 minutes or more before spreading with a spatula onto siliplat sheet (or, just on a lightly greased pizza pan/ cookie sheet). Par bake at 400° for 10-15 minutes. The crust should look fairly dry, but not browned. Add toppings and cook at 425° for 14 minutes. The Sauce–do you need a recipe for that? I’ve been making it since I was about 8, never the same twice, so I’ll just have to give you generalizations and let you experiment on your own. This should be enough for two, big pizzas. 1, 14 oz. can tomato sauce or crushed tomatoes (choose no salt added if you are watching your blood pressure, as pizza, I must point out, is not a low-sodium food). 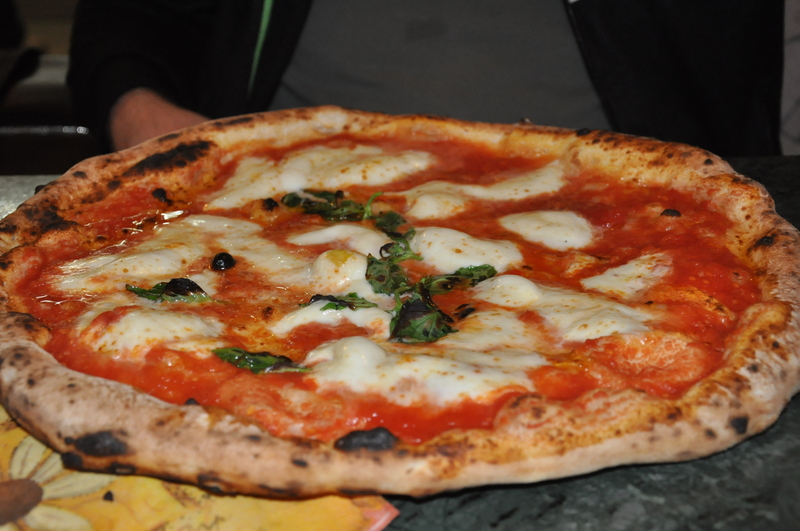 Toppings–wanna be more Italian in your style? Less is more. Picture large patches of sauce showing through little mountains of fresh mozzarella or gorgonzola, with maybe three anchovies tossed on with a sprinkle of capers. Lots of shredded mozzarella, then things like fresh mushrooms***, olives, bell pepper, onion, Italian sausage (pre-cooked and crumbled), pepperoni, salami. If you want to go a little crazy, add some artichoke hearts. They’re awesome. * A word to American pizza. My family’s Italian exchange student when I was a sophomore in High School (“Hi Luca! if you ever stumble upon this”) tasted his first bite of my mother’s homemade pizza and said. “Mmmm. This is good. It’s not pizza. But it’s good!” Now, to clarify: this statement was never meant, in any way, shape, or form, to include “Taco Pizza” or “Cheeseburger Pizza”. Tacos stand alone as a delicious food, as do (well made) cheeseburgers. Let’s not push it people and put them on pizza. **Luca insisted you were just supposed to swill one garlic clove around in the olive oil and then discard it. Crazy! That ain’t right, throwing away garlic that’s just perfumed the oil. What do those Italian’s know anyway? Chuck it all in. I did next time we made pizza and he got mad at me until I told him fresh garlic was expensive in the small town where I grew up in the 1980’s. Then he looked sheepish. I don’t know if it was really expensive, I just wanted more garlic flavor in the sauce! ***Another thing Luca told me is this, “Mara, you have to understand something. Italians, love, mushrooms!”. So I suggest you don’t leave them off your pizza. ← What kind of project is a good fit for grant funding? Eric believes that every inch (and I mean every inch) of a pizza must be loaded with a topping of some sort, preferably layers of toppings. He’d do terribly in Italy. Now I just really want pizza. Well, maybe there’d be things other than pizza in Italy that he’d like…Roman Ruins? They don’t taste as good though. I frequently make “too much” of something and tuck it away in the freezer for the next time. Great for a busy family, or anyone who wants homemade food, quickly! I even keep certain things in the freezer that is ready to eat. Eg:- bolognese sauce, ginger garlic paste, tortillas, sausages etc. …homemade tomato sauce and freezer jams, left-over split-pea soups ready for your lunch on a work-day…love it!